Buy Marigold Swiss Vegetable Vegan Bouillon Powder (purple tub) 1000g 1kg in the UK from our online shop or directly from our independent Scottish store. Bouillon powder for instant stock or a delicious hot drink. Contains less salt than the green tub. Reduced salt, still flavoursome! Vegan bouillon powder. Where can you buy real Bouillon Less Salt (Purple) 1000g safely online? 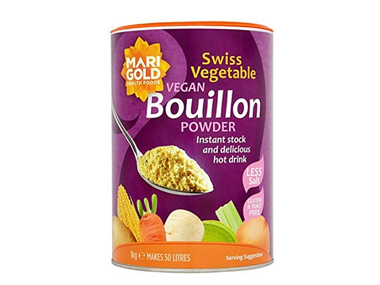 If you are wondering where you can buy Marigold Swiss Vegetable Vegan Bouillon Powder (purple tub) 1000g 1kg safely online in the UK, then shop with us. Bouillon Less Salt (Purple) 1000g - Marigold Swiss Vegetable Vegan Bouillon Powder (purple tub) 1000g 1kg in Stock & Bouillon and Herbs, Spices & Salt.